Daphne Scrunchie ~ Additional volume to your hair can be achieved with the Daphne Scrunchie. 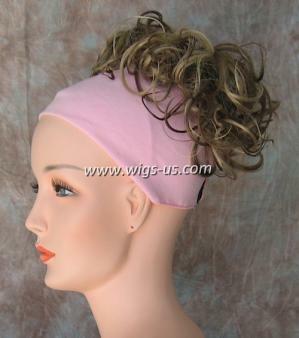 This hairpiece can be used as a pony tail holder or just a scrunchie when needed. The hairstyle itself consists of a mix of 7 inch wavy hairs, and 4 inch corkscrew curs. Together they combine to offer women the Daphne look. A great idea for this would be to style your own hair in a similar fashion, and then attach the scrunchie at the base. Another good idea would be to just place your hair up into a bun, and place the Daphne over it. You have a hot new look that required no time at all to achieve. As part of the Mona Lisa Collection, the synthetic hair fibers used to create the Daphne are soft and flexible. This isn't a throw away scrunchie that will last for only a week. You can use this over and over again with the same superior results as the first time. Available in many different colors, special order your very own today at no extra cost.